COMPLETE Machine Tools will launch two new products during AUSTECH; the Salbend CNC touch screen mandrel tube bender and the Everising NC-460 fully automatic bandsaw. Salbend tube bender is a touch screen controller with conversational function. It is perfect for applications where tubes need to be bent to make products such as chairs, beds and hand rails. Advantages include a basic layout for simple programming and reliable hydraulics and electrics. The NC-460 fully automatic bandsaw features a NC touch screen panel which can select the type of material being cut and will automatically calculate what blade speed is needed and what feed rate is needed. It has a self-diagnosis system, automatic positioning guide arm, out of square detector, floating shuttle vices front and rear, hydraulic carbide guide clamping, automatic chip conveyor and idler wheel blade breakage and stalling cut off device for safe working. 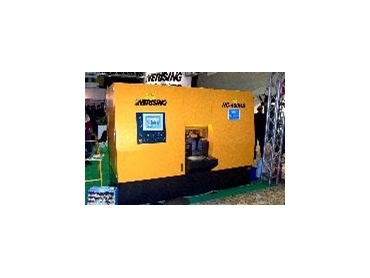 This machine can use carbide blades and is suited to steel merchants dramatically increasing production. Complete Machine Tools is at stand J10 in the Austech Pavilion at National Manufacturing Week 2005, in Melbourne, May 10-13.